The Royal Enfield Classic 350 recently received a range of official accessories to improve usability and also to enhance its looks. They include alloy wheels, knuckle guards, luggage racks and a headlight guard. These add-ons come with a 2-year warranty as standard. Head here to know more about them. The Royal Enfield Classic 350 is powered by a 346cc single-cylinder air-cooled engine which churns out 20PS at 5250rpm and 28Nm at 4000rpm. A 5-speed gearbox transmits power to the rear wheel via a chain drive. Suspension bits include telescopic forks up front and twin gas-charged shock absorbers at the rear. The motorcycle gets dual-channel ABS as standard for optimum safety and is priced at Rs 1.52 lakh (ex-showroom Delhi). 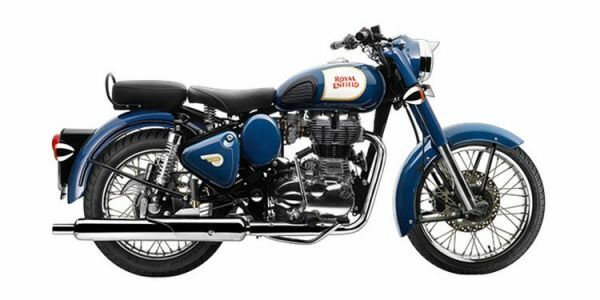 Royal Enfield Classic 350 prices start at Rs. 1.39 lakh (Ex-Showroom) and the top end variant Royal Enfield Classic 350 Signals Edition is priced at Rs. 1.64 lakh (Ex-Showroom). Royal Enfield Classic 350 is available in 6 variants and 10 colours. The claimed ARAI mileage for the Royal Enfield Classic 350 petrol is 40 kmpl. Weight, Engine not powerful enough for spirited highway runs, Lack of useful features like tachometer, fuel gauge, ABS, etc. The Classic 350 is perfect for riders who are looking for a minimalist, retro motorcycle that comes with the Royal Enfield lineage. In line with the retro character, the Classic features metal-encased telescopic forks that lead to a chrome crowned headlight. The instrument cluster is an analogue single-pod unit with a speedometer and an odometer. There is no fuel gauge but what you get is a low fuel warning light. Circular chrome mirrors also enhance the retro appeal. The switchgear offered comes with all the basics. The Classic's fuel tank comes with an old-fashioned chrome tank cap and black rubber-finished knee pads that offer it the age old touch. Riding saddle is spring mounted and enhances the overall retro appeal. The Classic also gets an uncluttered rear section with smooth flowing mudguard leading to the tail-light. Spoked, chrome wheels further highlight this Royal Enfield’s Classic styling. The overall quality and finish are slightly improved but still isn’t at par with most modern Indian motorcycles. The 346cc, single cylinder, 4-stroke, twin-spark motor generates a maximum output of 20.08PS at 5250rpm and 28Nm of torque at 4000rpm. The power is transferred to the rear wheel via a five-speed gearbox. The Classic has a fuel capacity of 13.5 litres and weighs in at 192kg. Braking is managed by a 280mm disc up front and a 230mm drum at the rear. Royal Enfield Classic 350 Competitors Mojo 300: The Mahindra Mojo does great justice to its touring dynamics. The refined motor, comfortable riding dynamics, supple ride quality and loaded parts bin make it a great motorcycle for long distance riding. Bajaj Dominar 400: If you’re looking for an affordable, fast and comfortable highway cruiser that performs well in the city too, then the Dominar 400 definitely deserves a closer look. It’s a muscular motorcycle with an exhaustive list of features. Royal Enfield sells the highest number of motorcycles in the 250cc to 500cc segment in India. If you are looking for a retro classic motorcycle, there is nothing that comes close to being a proper retro. That said, we wish to see more features, better refinement and reliability on offer from Royal Enfield.